・The Chugoku Electric Power Co.,Ltd. New ecological concrete that reduces CO2 emissions below zero level by capturing CO2 has been developed. 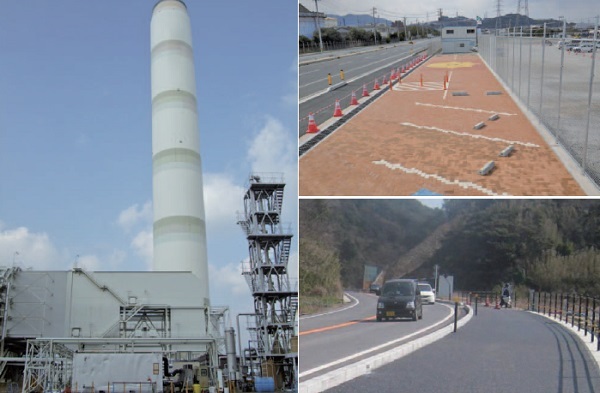 This ecological concrete is named “CO2-SUICOM” (CO2 Storage under Infrastructure by Concrete Materials).This concrete is based on two typical features. The One is using a special admixture (the γ phase of dicalcium silicate: γ-2CaO.SiO2) instead of cement. This material has a very low level of CO2 emissions and hardens the concrete by reacting with CO2. The other is capturing CO2 contained in the exhaust gas from thermal power stations. This is the first technology of its kind in the world. 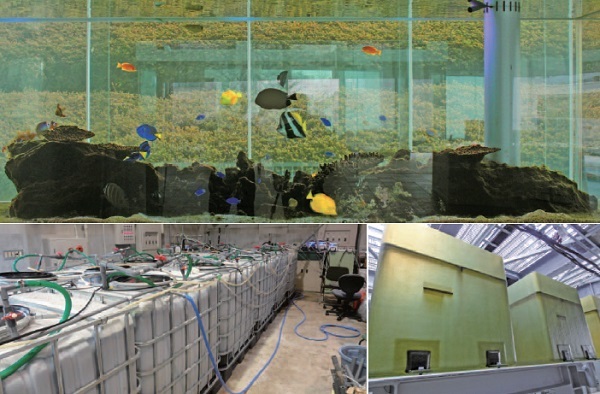 In aquatic breeding facilities, such as aquaria and aquaculture facilities, it is important to reduce the quantity of sea water supply and drainage volume from the viewpoint of economic efficiency and environmental load reduction. In this study, we determined the optimum conditions necessary for bacteria’s denitrification reaction. We developed a new recirculating biological denitrification system using denitrifying bacteria which has enhanced to the high salinity environment. Although the fresh seawater was supplied usually for a number of aquaria located on the coast, the environmental load given to a sea area with this conventional technique and CO2 emissions which arise by intake or conveyance of seawater can be reduced. Thus, this proposed system can be deployed to various areas such as denitrification of sea wastewater occurs in geofront constructions and inland aquaculture facilities. Hikawa Bridge is a structure of Kyushu Shinkansen Kagoshima route. A sandbank adjacent to the structure is a wintering ground of endangered species 'black-faced spoonbills'. In this project, we surveyed the habitat before beginning instream construction and created the compensatory rest areas to attract Black-faced Spoonbills using attractant, decoy (model). In addition, we shifted the construction period to non-drought period and construct the bridge one side so that birds cannot recognize the change of scenery. 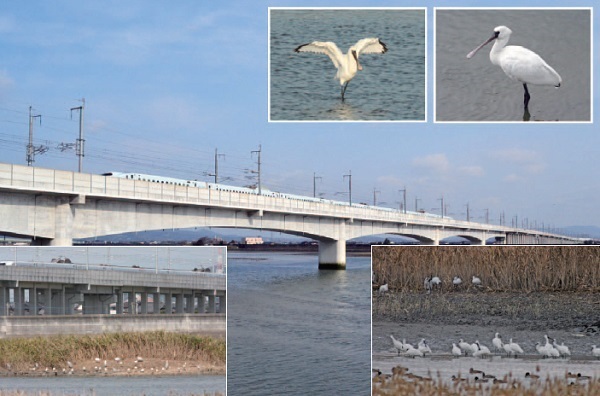 With these efforts, the number of black-faced spoonbills flying to this site increased more than 30 even after starting operation of the Shinkansen. ・Nankai Electric Railway Co., Ltd.
“Namba Parks” consists of a high-rise office building and a commercial complex located in the large-scale redevelopment area. Commercial complex has a 5,300 m2 rooftop garden with mixed forest and water area for local living creatures. “Green management” is also promoted. For example, pesticide is never used for vegetation maintenance and staffs always work in the garden for a communication with their guests. 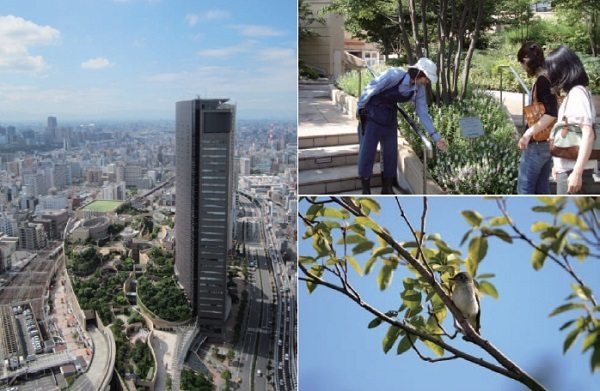 As an academic approach to evaluating environmental benefits of rooftop vegetation, biodiversity, thermal environment and CO2 fixation by trees were investigated. These results supported that this garden contributed not only to improving urban environment but also attracting guests, consequently, boosting the economic benefits. 3. The improvement of fishway facilities and its monitoring in Miyanaka intake-dam to harmonize the river environment and hydropower. ・East Japan Railway Co., Ltd. 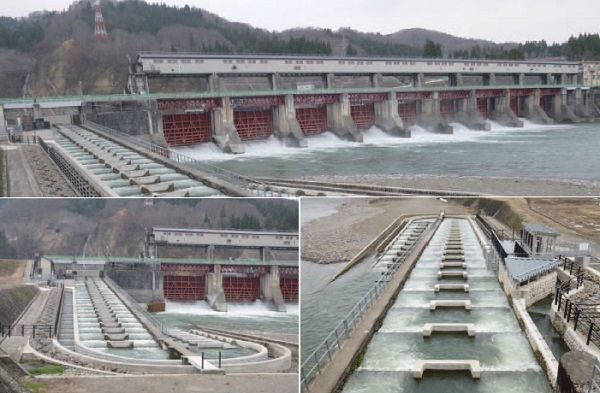 The problems associated with the fishway at the Miyanaka intake-dam were the followings;, discontinuity flow between the fishway and its downstream river, and the unstable flow in the fishway as well as itsthe gate. JR-East improved the above problems based on an numerical analysis and the in-situ discharge experiment, while giving consideration to fish ecology, and river structure at the downstream, and the safety of facilities, and verified its effectiveness. In addition, applying the method of an adaptive management, the continuous monitoring proved the conservation and creation of the migration environment. “UE-Net”Urban Ecological Network Simulation System is developed to evaluate the ecosystem networking effect of greening to the surrounding environment of construction site. Utilizing very high-resolution satellite images, UE-Net system visualizes the present habitat networks for the indicator birds and butterflies, which live in woods, grassland and wetland. Simultaneously, it quantifies the effects by different type of greening plans. 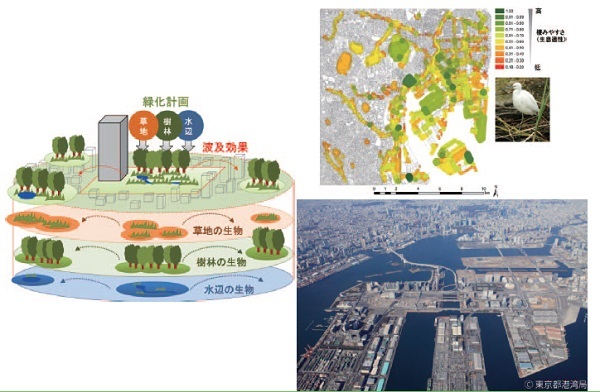 This system was applied in the urban greening projects mainly around Tokyo Bay Area, and contributed to realize the ecological consideration in the greening of urban infrastructures, such as roads and semi-public open spaces in private urban developments.